Ele served as one of WildClaw’s trusty helper monkeys for several years before joining the company, but that was really just so they’d let her near the sharp objects. She has appeared in WildClaw’s Kill Me and The Shadow Over Innsmouth; wrote The Bridal Suite for Motel 666; produced and co-wrote WildClaw’s holiday salons, Open Heart Surgery (Valentine’s Day), Risen: Rebirth, Renewal, Revenge (Easter—natch), and SNAKES! A St. Patrick’s Day Nightmare; and serves as WildClaw’s Director of Public Outreach and resident Foley artist. 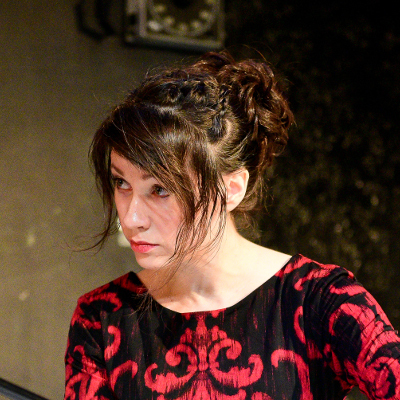 She has designed and performed Foley for companies including Hartlife NFP, Lifeline Theatre, Oak Park Festival Theatre, Columbia College Chicago, Otherworld Theatre, Starlight Radio Dreams, Festival 56, Stone Hearth Theatre, MCL, Locked Into Vacancy Entertainment, and The Second City Training Center. In addition to her haunted home, she is a company member with The House Theatre of Chicago, and her native-Dallas’s Mr. Toad’s Theatre Circle. You can hear Ele’s voiceover performances as Cassie Wilkins, Switchblades Cobalt, and more(!) in Hartlife NFP’s award-winning, post-apocalyptic audio drama Our Fair City, and as part of the ensemble in their upcoming series Unwell.